A good friend sent me a Facebook message this week. She was distressed. A reader of her most recent book left a hurtful, one-star review on Amazon.com. She’s not gotten many bad reviews in her career as an author, because my friend is thoughtful, wise, and a terrific writer. She told me that in the past she’s just ignored tepid reviews, but that this one was particularly nasty and hurtful. She was right. It was nasty. And hurtful. And then I asked my friend to do what she didn’t want to do: Answer the review, and take the high road. When confronted with criticism, our instincts take over. We either pick a fight or turn the other cheek and pretend it didn’t happen, as a defense mechanism. This is why so many business owners ignore customer complaints. The gripes cut too deep, so we put our fingers in our ears and try to drown them out. Each complaint feels like a personal affront, and cynicism begins to set in. It starts as a dismissive attitude about customer grievances, but can easily morph into distrust of the entire concept of customer feedback, especially online. So it’s no wonder that we struggle with how (or whether) to respond to negativity. Certainly, it can seem easier and better to simply ignore customer feedback. After all, “ignore the trolls” is a popular saying, right? But “ignore the trolls” is actually terrible advice, for two reasons. 1. No response is a response. At some point in your life, you have almost assuredly complained to a business and heard NOTHING back from them. Did that make you feel better about that company, or worse? Worse, of course. I researched that attitude shift in my book, Hug Your Haters. In my research with Tom Webster into the science of complaint, we found that not answering a customer complaint decreases that customer’s advocacy about your business by as much as 50 percent. You are essentially kissing that customer goodbye, forever. 2. It’s about the audience. But what if you are prepared to lose the customer? In my friend’s case, it was already pretty unlikely that she was going to be able to sell her next book to the unhappy reader of her current one. I advised her to reply to the one-star review not to placate the customer, but as a demonstration to the audience of hundreds or thousands of people on Amazon.com that will stumble across that one-star review from today into the future. The economic impact of the audience is far, far, far greater than the economic impact of whichever single customer complained. This is why online customer interactions on Amazon, Yelp, Trip Advisor, Facebook, Twitter, Houzz, and hundreds of other places has totally changed the math of customer service. Customer interactions are often a spectator sport today, and every reply to a customer is nothing but an opportunity to demonstrate your values in a way that will nudge members of the audience to buy from you. Each customer interaction, including (and perhaps especially) the negative ones, is an invitation to tell your story. And why wouldn’t you tell your story at every opportunity? Wink is a frozen dessert concoction that is sold in grocers’ freezer cases, near the ice cream. The big difference is that Wink is gluten-free, soy-free, dairy-free, sugar-free, etc. It’s a product created for a particular market segment. Consequently, it’s not universally beloved. An angry customer wrote a scathing complaint about the product on the official Wink Facebook page. Most brands would have simply deleted the post. But not Wink. They know a storytelling opportunity when they see one. “We’re sorry to hear this. While Wink is definitely not ice cream, we do aim for an ice cream like experience. The creator of Wink is a 25 year-old named Gabe who has Celiac disease and dairy intolerance. We do recommend letting your pint sit out for a few minutes before you dig in. If the store you purchased Wink in gives you trouble with the refund, please let us know! Will that response make the angry customer suddenly like the taste of Wink? No. But, Wink just delivered a story about their founder, their values, and their commitment to customer service—a story told online, in public, in front of potentially many, many people. I’ve received a couple of one-star reviews on Amazon myself, so I already had a playbook ready for my friend. It was inspired by my pal, the author Dave Kerpen, who started doing this for one-star reviews of his own books, and taught it to me. “Thank you for taking the time to leave a review. I’m sorry that the book didn’t live up to your expectations. The book has been useful to many, but I suppose different readers are seeking different things. Apologies that I didn’t hit the mark for you, this time. When other potential book buyers see this reply, how will they feel? 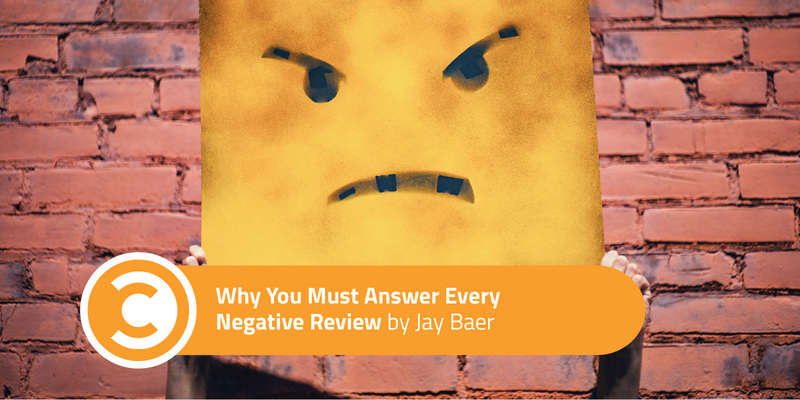 Every review is an opportunity, not a burden.